Spotted Kelpfish at Tajiguas. I can never tell spotted kelpfish from crevice kelpfish; maybe this is a spotted kelpfish, since the green spot is relatively unique. 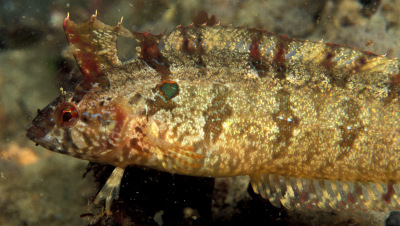 I usually go with spotted kelpfish, since crevice kelpfish are said to inhabit deeper waters. But, apparently even the pros have a hard time telling for sure.